Destiny 2.0 is an easier and more spectacular version of its predecessor. Now, people with no big experience in magic will be able to astonish their audience with an even more entertaining effect. Besides, if you are just an amateur and have no abilities in magic, you will find enclosed a document that contains instructions to build yourself the "Destiny Deck", a way to perform with no skills at all! You will also find a copy of Destiny Evolution 2; a trick that merges the original Destiny effect with an imaginary poker hand. Obviously everything will be done with a single deck of cards coupled with very minor skills. 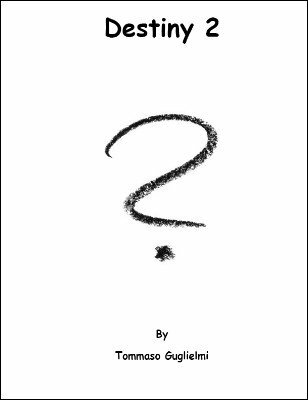 Unlike the first ebook, in this one Tommaso describes only the easiest version of ACAAN, where little dexterity is required. A performer places a prediction on the table along with a deck of playing cards. Then he asks a spectator A to think of a card and invites spectator B to pick the deck of cards from the table and start dealing them out one by one (obviously as many as he wants). Result: The thought of card will correspond to the last one dealt on the table by the spectator B and the prediction, left on the table at the beginning of the effect, will foresee both the thought of card (by the spectator A) and the number of the cards dealt on the table by the spectator B. This number will appear written on the prediction card. A conjurer places a prediction (written on a piece of paper) on the table, then shows a deck of cards and asks a spectator A to touch 4 cards. The conjurer removes the 4 cards and puts them in view on the table. Then the same spectator is asked to shuffle the cards that will never be touched by the conjurer anymore. Later, the conjurer invites a spectator B to perform a mental experiment. This experiment is a imaginary poker match, where the cards will be just in the spectator B's mind and nowhere else. Spectator B chooses his imaginary cards then he is asked by the conjurer to think of just one of the cards he has got in his mind. Meanwhile, the conjurer invites spectator A to think of a number between 1 and 48, and asks him to deal out face up as many cards as the number he is thinking of, and keep the last card face down. Now the conjurer asks the spectator B to name the card he is thinking of. Result: The card thought by the spectator B will correspond to the position thought by the spectator A. Besides, the thought of card along with the four cards (chosen at the beginning) will get a Royal Flush. Eventually, on the prediction paper there will be written: "The conjurer wins the mental poker with a Royal Flush." Destiny deck is a perfect solution for anyone who wants to perform Out of Destiny without any skill and 100% hands off. The spectator performs under direction of the conjurer an "Any Thought of Card At Any Thought of Number". No Stooges , No Force, 100% hands off. 1st edition 2009; 94 pages. The video below is in Italian but there are speech bubbles with English translations in it.